Use Write On 2-sided aluminum laminated tags in any application where you need to be able to “write on” information in the field, in the shop or wherever necessary and the message permanently indents into the tag so your message is protected for future reference. No worries about your message washing off or fading. These tags can be indented with a pen, pencil, nail or even your fingernail if necessary. Our tags are always made from the highest quality products and are comparable to Scot-tags. Dead soft tags are a weatherproof silver foil laminated aluminum tags that have a soft core center enabling you to write on the surface and permanently indent the message into the tag. These tags can be ordered blank or custom imprinted with your specific information. Tags can be made in a variety of sizes, with or without eyelets and with or without wires attached. Write on aluminum laminated tags can be written on with a ball point pen or any sharp object to make a permanent indention into the tag. These tags can go through a washing or painting process and the indention will still be legible. Write on Tags can be used for inventory, inspection, wire reel, meter tags and have many other uses for identification and record keeping. Constructed of a tag board core center with aluminum laminated on both sides. 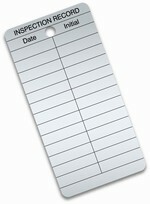 Contact us at 1-888-278-0188 to order your custom or blank Write on Tags.